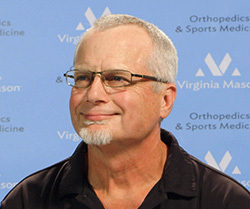 When Nik decided to look into hip replacement surgery, his physician at the Virginia Mason Lynnwood Medical Center referred him to a Virginia Mason orthopedic surgeon in Seattle. It was clear from the comprehensive assessment Nik was given that osteoarthritis had worn away his hip joints and this was the source of his ever-increasing pain. Bone was rubbing on bone. But even with the aching pain, Nik hesitated. “I was only 59 and had never had major surgery,” he recalls. “It’s hard to think about giving up a part of your body.” While he was considering the surgery, Nik did a lot of research and decided that when he had his operation, he wanted an “anterior” rather than a “posterior” procedure. Virginia Mason is a leader in anterior hip replacement surgery in which the surgeon accesses the hip joint from the front, as opposed to the lateral (side) or posterior of the hip. This allows the doctor to replace the hip joint without detaching muscles or tendons. Advantages are thought to include a quicker recovery time and return to normal daily activities. Nik found that to be true when he had his first hip replaced in August 2013. He was out of the hospital in 48 hours and within two months was back at his one-hour spinning class. Enjoying full sessions of hot yoga and playing 18 holes of golf. If you would like more information about Virginia Mason’s joint replacement programs, call us at (206) 341-3000.